The PEM modulates light polarization. When a PEM is used between two crossed polarizers, the set-up can modulate the intensity of a light beam (chopping). This intensity modulation is at a fixed frequency between 40 and 200 kHz. When the PEM is set up between a circular polarizer and a linear polarizer the following "on and off" chopped waveform is obtained. Note the obtained waveform approximates a 50/50 duty cycle. The extinction ratio is set by the extinction ratio of the polarizers used in the optical path. 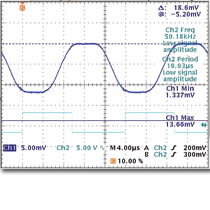 T. C. Oakberg and B. Wang, Application note - Light Intensity Modulation Using A PEM, Hinds Instruments, Inc. (1995). Contact us for more information on PEMs and Optical Chopping (Intensity Modulation).